Most of our leisure travel time is spent visiting family and friends. Like so many other real families, our loved ones are scattered around the country….so spending time in person requires travel. As much as we miss everyone and want to see them, my husband and I decided after our son was born that once or twice a year we would go on “just us” family vacations. Our goal is general to go someplace where we’ve either never been, or haven’t see in many years. Usually these vacations are focused on three things: relaxation, time together away from the usual daily distractions, and exploring. This past weekend was an exception to that rule. 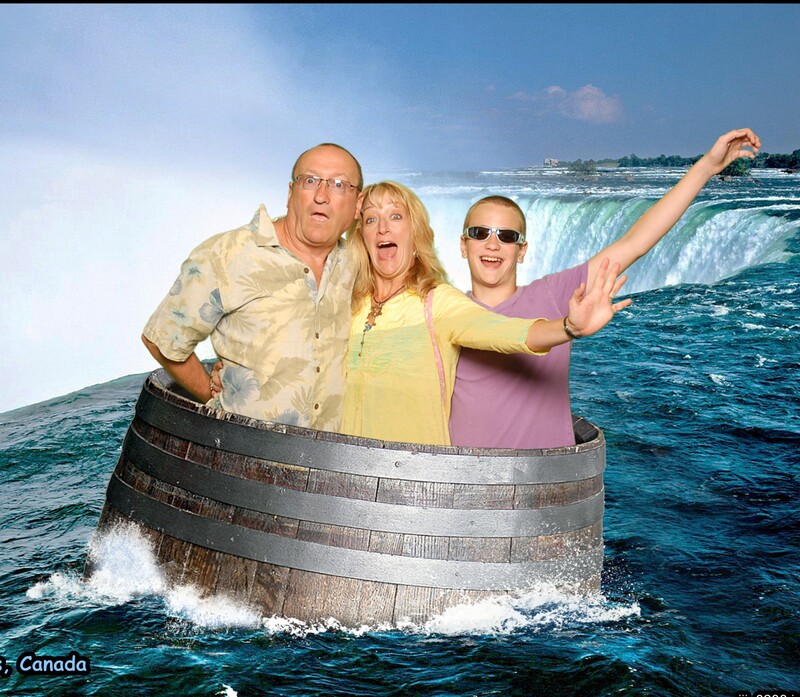 We took a short vacation to an area which is 100% touristy: Niagara Falls Canada. Neither my husband or I had been there in over 20 years – and the natural wonder of the Falls never ceases to amaze with their power and beauty. Yet surrounding them is every form of “TTT” (Totally Tacky Touristy) activity one can imagine – all in the name of fun and remarkable expense. As the typical R.W. and Family Planner, I did my best to mentally prepare us all to take this slight departure from our normal vacation of peaceful camping trips or beach lounging. We enthusiastically felt prepared to enter the Tourist Zone. For the most part, I can report that we three held up to the challenge. We visited wax museums to have our photos taken with replica celebrities, we donned rain ponchos to experience a 4D theater reenactment of the creation of the Falls, we soared 700 feet up in a tower for incredible views, we sat on a bench and ate ice cream in the bustling part of town that looks like Las Vegas and Times Square got together and gave birth to an illegitimate love child….and we joined thousands of other visitors to feel the water and mist on our faces and took dozens of photos. We marveled at the “melting pot of humanity” that a location like Niagara Falls attracts. There were several moments where we were surrounded by so many different languages that we were the only ones speaking English. Apparently curious people from all over the world come together to see 35 million gallons of water per minute rush by. We did have fun. Yet we each hit our Thresholds of TTT at different times. For my husband, his threshold was being trapped in an elevator full of strangers 500 feet above the Falls. For my son, it was the miles of walking in between crowded venues. As for me, it was the noisy hotel neighbor at 1:30 a.m. and the need for space and tranquility. So on Day 3 of our trip, we sought out quieter, more relaxed open spaces like a Botanical Garden and scenic stops further downstream. As we get older and wiser, we are better able to predict our reactions to certain circumstances. Hence why this was a shorter trip – we knew that 3 ½ days would feel like enough. We know now when to take breaks from the hustle and crowds, when to retreat to our hotel room for quiet rest time, and how to add time to our travel plans for enough “detox” time back at home. We have come to recognize and respect our Thresholds and when we’ve had enough – before we sour a good time. Within one hour of being back home, my husband was out doing yard work, I was off for a bike ride, and my son was reconnecting with his friends and his video games. All things were back to normal. After all, we are a real family – and something can be said about recognizing Togetherness Thresholds as well. This entry was posted in travel, Uncategorized, Vacation and tagged attractions, crowds, family trips, Niagara Falls, tourism, travel, vacation. Bookmark the permalink.